I’m agree with parts of this vision – certainly I do believe the low hanging fruit will be the first to be plucked by carriers as they look to get rid of solutions which rely on proprietary hardware. Of course interoperability will be an important issue and every provider of software solutions will be working with one another to ensure they work together seamlessly or risk missing out on important bids. 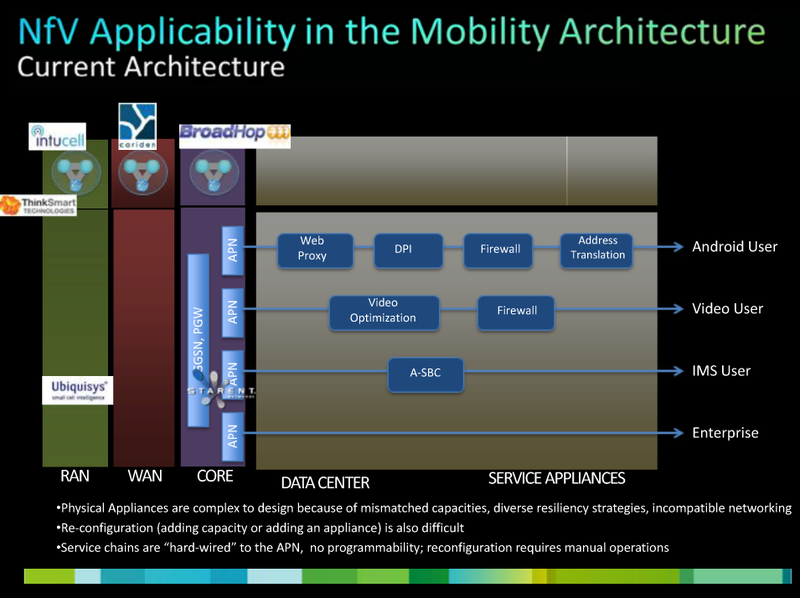 Does everyone has an NFV strategy – even Cisco? It seems every company in the market has been working on an NFV strategy and Tom Nolle echoes this sentiment in a recent post. He goes on to say Cisco’s intentions are less clear than others in the market and they risk falling behind Alcatel-Lucent. Moreover, he explains how the vision John Chambers espouses of Cisco becoming a cloud company is made possible only by fully embracing NFV. What we’re left with now is the NFV piece, and I confess that Cisco’s approach to NFV is the one I have the least information about. Operators in my spring survey told me that Cisco had shared NFV thoughts in confidential discussions, but almost half those who had heard the story said they didn’t fully understand the position. To be fair, Cisco may have been a victim of NFV literacy; the standards process had at the time of the survey only just gotten off the ground (the first significant public documents came out today, in fact). However, even today there’s more visible of competitive NFV implementations (particularly Alcatel-Lucent’s which is public) than of Cisco’s. While standards come and go it does seem at this point NFV is the one you need to implement if you want to play in software transformation game. The reason that having a good NFV strategy is important for Cisco is that NFV is the only movement toward orchestrating the cloud/network fusion that has any realistic chance of success. I don’t know how many people in the ETSI process would agree with this (many of the operators do, I know) but what NFV is about is really the provisioning of fused services. Yes, you can apply the principles to hosting virtual functions but you can also apply them to hosting anything that requires cloud deployment and network integration. 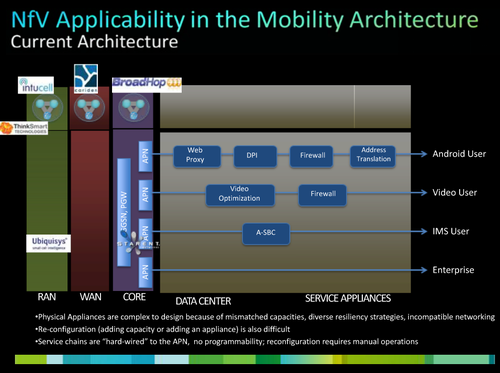 A good NFV implementation is a great cloud foundation, and an unsurpassed framework for things like mobile empowerment. Again, this is completely logical. A few months ago Kelly Ahuja SVP, GM, Mobility Business Group spent about an hour discussing the impact of NFV on the company’s business. The bottom line is Cisco expects the move to software to be less lucrative but the flipside is they expect to expand their business into many other areas as part of the carrier transition to software on COTS servers utilizing network functions virtualization. Here is a slide from the presentation – my post has many more which shows the networking leader’s commitment to this market. NFV will be in important in 2015 at earliest? Barclays says that NFV isn’t going to be a factor in the market until “at least 2015” but Nolle and I disagree. We know that cloud is the future – not just for the business communications market as I wrote about earlier today but also for carriers. We also know that OTT players are rapidly taking share from incumbent providers and their best chance to compete against not only OTT but a new wave of software telcos is to become one themselves. If carriers can’t get a software telco/NFV roadmap from their current solutions providers they will go elsewhere. In other words, talking about future strategy and being clear about it determines how your forward-looking customers buy from you today. I am very excited to see what the major players have to say next month at Software Telco Congress in Santa Clara – this will be the first event focusing on the transformation of carriers from hardware to software and there are literally tens of billions of investment dollars hanging in the balance as new paradigms and solutions are developed to enable carriers to function more like tech companies. Over the next month I’ll be putting together my opening remarks (I am the conference chairman and the company where I am CEO, TMC is the event producer) and it seems with all this change happening, it will be a very fluid document indeed.